Snow disappears, grass turns green and homeowners awake from their winter slumber. Home repair and remodeling along with a serious dose of yard work will power Lowes higher. Lowe's Companies, Inc., together with its subsidiaries, operates as a home improvement retailer in the United States, Canada, and Mexico. It offers a line of products for maintenance, repair, remodeling, and decorating. The company provides home improvement products in various categories, such as lumber and building materials, tools and hardware, appliances, fashion fixtures, rough plumbing and electrical, seasonal and outdoor living, lawn and garden, paint, millwork, flooring, and kitchens, as well as outdoor power equipment. It also offers installation services through independent contractors in various product categories; extended protection plans; and in-warranty and out-of-warranty repair services. The company sells its national brand-name merchandise and private branded products to homeowners, renters, and professional customers. As of November 5, 2018, it operated 2,390 home improvement and hardware stores. The company also sells its products through online sites comprising Lowes.com and Lowesforpros.com; and through mobile applications. Lowe's Companies, Inc. was founded in 1946 and is based in Mooresville, North Carolina. Company description from FinViz.com. Lowes is in the midst of a restructuring and the new CEO, Marvin Ellison took over in July. Since then he has closed stores all across the country and hired thousands of IT workers to improve online sales. 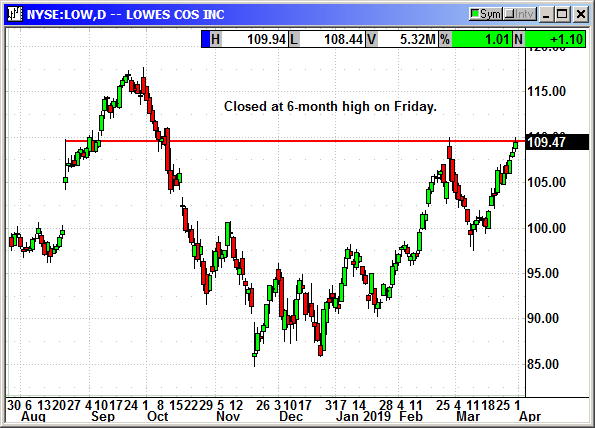 As a result, Lowes is closing the gap with Home Depot. In the last quarter the company posted earnings of 80 cents that beat estimates by a penny. Overall revenue rose 1% to $15.65 billion. The slower revenue growth was due to the store closures. The CEO said the hard work has now been done over the last six months and they are fully prepared for a strong spring and summer selling season. In January alone, same store sales rose 5.8%. Shares closed at a 6-month high on Friday and appear poised to retest the peak of $117 from September. I am using the June option to retain premium ahead of the May earnings. We will exit before the earnings. Buy June $115 call, currently $2.57, stop loss $103.85.